Downloadsquad announced yesterday that WordPress 2.7 is due out this evening. Automattic, the company behind the popular blogging platform put out the first release candidate version of WordPress 2.7 just a few days ago, but a beta version has been available for the last few months. WordPress 2.7 represents a huge shift away from earlier versions of WordPress – at least in the administration area. Most of the changes will be visible to bloggers, but not blog readers. But the changes in the admin area are huge. First, the navigation menus have all been moved to the left side of the screen, giving you more room at the top of the page. The submenus are all also collapsible, which allows you to navigate the administration interface without reloading the page as often. 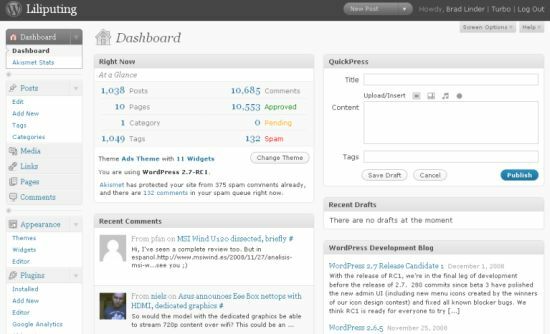 You can also customize the admin area by dragging, dropping, adding, or deleting widgets like the Right Now screen which gives you an overview of your blog stats or the QuickPress widget which lets you create a post using a stripped down WYSIWYG editor right from the start page. WordPress 2.7 also lets you search for and install plugins without leaving the admin area. And for the first time, an automatic upgrade tool is included in WordPress so you can upgrade to WordPress 2.7.1 or 2.8 or whatever new versions are on the horizon without having to fire up an FTP client. 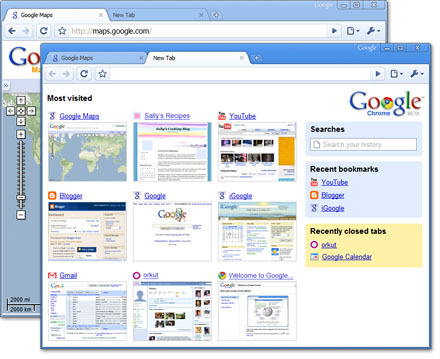 Google announced it will release a brand new open source web browser called Google Chrome. Yesterday a site went up, and has subsequently been taken down at http://gears.google.com/chrome/?hl=en (as of this morning clicking this link take you back to regular old Google). Windows Vista includes a feature, “Receive Window Auto-Tuning,” that you’ve likely never seen mentioned on your desktop, but which can cause noticeable drag and even crashing when browsing certain web sites or using some routers or other network hardware. If you’re noticing browsing glitches that only occur in Vista, the Wise Bread blog has a tip, pulled from PC Magazine’s recent issue, that explains how to turn off auto-tuning and skip the spinning blue circle of death. So I installed the WP Super Cache plugin. Seemed simple enough, I’d been using WP-Cache for a long time and was pretty please with it. WP Super Cache is based on the excellent WP-Cache plugin and therefore brings all the benefits of that plugin to WordPress. On top of that it creates copies of every page that is accessed on a blog in a form that is quickly served by the web server. It’s almost as quick as if the you had saved a page in your browser and uploaded it to replace your homepage. So that sounds good, except that I followed all the steps, let the plugin to it’s automagic stuff and then I got a 500 error when attempting to hit my site. OUCH! No good. Make that simple update to the first line, ensuring that the #BEGIN WPSuperCache is on it’s own line and everything started working as expected.